their allergens, odors and “accidents” don’t have to be. The CritterZone Air Purifier is Powerful, Filterless and Chemical-Free. An all-natural process that virtually eliminates odors, bacteria and other pollutants such as mold, mildew, E-coli, Staph, Salmonella, Listeria, and more. It safely and naturally kills germs in the air and provides a surface of protection to PREVENT germ and mold growth. Featuring 3 settings, you control the amount of natural charged flow to clean your room or vehicle; Virtually eliminating odors, bacteria and other air pollutants for up to 800 SQ FT! *COMPARE: Other plug-in air purifiers only offer coverage for 50-150 sq ft. One CritterZone Air Purifier offers up to 16 TIMES the effectiveness! To purify the air of an 1800sq ft home, it would require 7-10 units of comparable plug-in air purifiers, but only 2-3 CritterZone units: SAVING YOU HUNDREDS $! HOW? The CritterZone Air Purifier produces a natural and safe ionic flow to give indoor air the energy it needs to restore itself. This process virtually eliminates pollutants in the air, on surfaces and even in fabrics. This is essential for odor and germ control for common living areas, kitchens, nurseries, and pet areas. 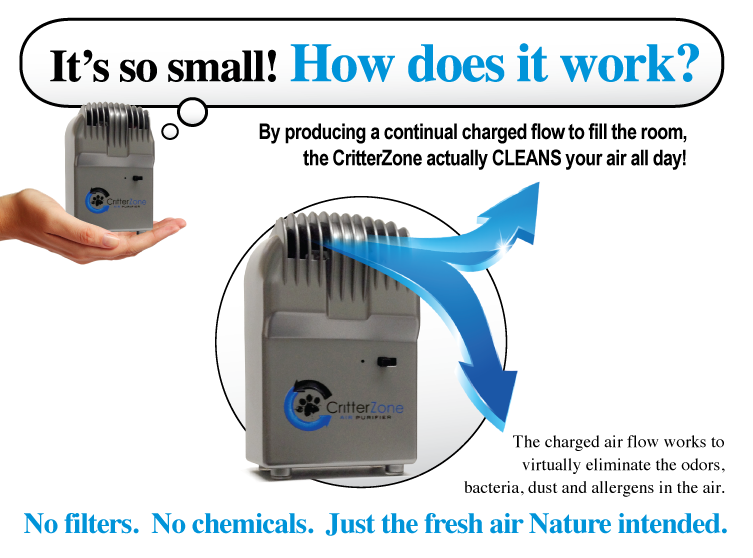 CritterZone cleans your air 24/7 for less than a penny a day, consuming under 3-watts of energy. Two designs for flexibility: Wall Plug-In Unit and Corded Unit, CritterZones are designed to clean the air of areas up to 800 sq ft and are only about 4” tall! It’s convenient size and portability makes it perfect for vehicles (with car adapter) and is ideal for trips to help with germs and odors of hotel rooms. Eliminate spills, urine and odors from carpet, upholstery, mattresses and more! No accessories needed! Within 30-60 mins, this unit can virtually eliminate human or pet urine from fabrics. Use on spilled milk, gasoline and other germ or odor concerns in your home, business or vehicle. Visit www.AirRestoreUSA.com for more details! It really works! CritterZone Wall Plug-In Air Purifier - Unbox. Plug-in. Flop on the couch and watch T.V. That’s how easy this product is to set up! The unit plugs directly into the wall (not really meant to sit on the floor in a power strip) near the area you want to treat. CritterZone Air Purifier with Adapter w/cord - If you don’t have the room on the wall or just want to bring the CritterZone a little closer to the source, we offer the same unit with a 10 ft. cord. Simply put, The CritterZone Air Purifier continually produces a charged flow to fill the room which cleans the air all day long, virtually eliminating the odors, bacteria, dust and allergens. For years pet owners have tried to cover up smells with sprays and fancy powders, none of which are really that effective for a long period of time. Some say that filters are great for taking out allergens. This could be true ONLY IF you can convince the allergen to go through the filter. We knew that the real answer is to actually PURIFY the air. How? Natural Air Restoration Technology : A revolutionary technology that naturally cleans the air we breathe. The air we breathe is filled with various contaminants: Dust, Dander, Bacteria, Dry Protein from Feces, Mold, Germs, Viruses and More. It also contains the natural ingredients of the fresh air that Nature intended: Oxygen, Nitrogen, Hydrogen, Water Vapor, etc. CritterZone restores the air we breathe to it’s natural conditions with two distinctly different, but related, continual processes: Bi-Polar Ionization & Plasma Conversion. Bi-Polar Ionization is a continual process whereby massive streams of positive and negative ions are released into the environment. These ions create charges on the solid matter in the air, which are then attracted to the particles of the opposite charge until they grow heavy enough to settle out of the air. As the air restores around the CritterZone, the process extends deeper into the environmental space, quickly cleaning a large area from a small source. Filterless: Filters are very limited and expensive. CritterZone is far more effective at actively destroying the odors and allergens in the air than filtered systems. Flexible: Small yet crazy powerful means that when “special situations” happen, such as pet accidents or even spilled milk on the carpet, the CritterZone can easily be moved temporarily to solve the problem quickly and directly. Cost Effective: costs less than a penny per day to run– making it very affordable to clean your air 24 hours a day, 7 days a week! IT’S HEALTHY! : Use for more than just pet problems! CritterZone is ideal to keep the air clean for anyone with severe allergies, homes with young children who bring home germs from school and friends’ houses, seniors, offices, classrooms, you name it. CritterZone can help prevent airborne illnesses, and clean air can improve thought processes and breathing cleaner air can even increase life expectancy. Click the button below to add the CritterZone Air Naturalizer to your wish list.